Comrade Jose Maria Sison, Chairman of the Communist Party of the Philippines and Chief Political Consultant for the National Democratic Front of the Philippines, has released a statement backing a move by Makabayan (Patriotic Coalition of the People) Chairman Neri Colmenares and several progressive groups asking the Supreme Court to block a $62-million loan from China to fund the construction of the Chico River Dam. 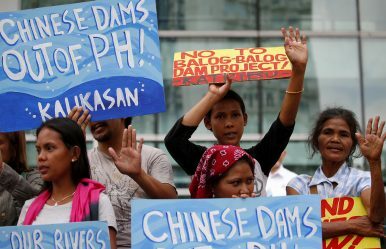 Under the loan arrangement, the Philippines is deprived of its sovereign rights, caught in a legal trap similar to the Investor-State Dispute Settlement clauses that were an unacceptable feature of the Trans-Pacific Partnership agreement pursued by US imperialism. We publish Comrade Sison’s statement as further evidence of Chinese capitalism’s social-imperialist orientation and recommend that interested readers look at our publication Explaining China: How a socialist country took the capitalist road to social-imperialism available here. As urgent relief, they also ask the Supreme Court to issue a Temporary Restraining Order (TRO) and/or Writ of Preliminary Injunction, to enjoin Respondents from enforcing the loan agreement. The respondents are Pres. Rodrigo R. Duterte, Exec. Sec. Salvador C. Medialdea, DOF Sec. Carlos G. Dominguez III, NEDA Sec. Ernesto M. Pernia, DOJ Sec. Menardo I. Guevarra, NIA Administrator Ricardo R. Visaya. 5. It contains an express waiver of sovereign immunity over the State’s patrimonial assets in favor of a foreign government in violation of the Constitution (Art. XII, Sec. 7; Art. II, Sec. 7; Art. XII, Sec. 2). The Duterte family and traitor gang have been benefiting from relations with China at the two levels of official transactions with the Chinese state and criminal transactions with Chinese triads involved in the smuggling of drugs, rice and other goods to the Philippines. The criminal transactions started as early as when Duterte was still mayor and connived with the Chinese triads in using Davao City as a major smuggling point. Watch: Neri Colmenares What happens if the Philippines can’t pay off loans from China?